In 2013, I celebrated my first Mother’s Day without my son. I didn’t think anyone would remember this, but I had several women say they were thinking of me. They hadn’t forgotten. That is the only thing I remember about Mother’s Day 2013. When you lose a child, you suffer from silent grief. No one wants to bring up the pain, especially not on Mother’s Day. Everyone is tiptoeing around the elephant in the room. What they don’t know is that I am already thinking of my son. I miss his sandy curls and long eyelashes. Nothing anyone says will remind me of this more than the hole in my heart. It took so long to become a mother and then in a brief instant, he was taken from me. My road to motherhood was a twisted, rocky journey of eight years. Infertility and my husband’s cancer diagnosis made it impossible to have biological children. During the years of waiting to adopt a child, I struggled to go to church on Mother’s Day. Afterwards, I nearly sprinted out of the church to get to my car. Worst of all, I had no one to share my hurt with and then felt guilty for not being happy on a day, which should be, by most people’s standards, a happy one. I’ve said it before and it’s true: we are not always kind to ourselves in pain. We tell ourselves to “get over it” and “pull up our bootstraps” and so many other things that are incredibly helpful. So on top of our pain, we shovel heaping doses of guilt and shame, because we don’t know how to pull up our bootstraps. We don’t even know what a bootstrap is. Growing up in a small church in the Midwest, our congregation had the traditional Mother’s Day Recognition, or as I call it, Parade of the Queen Mothers. These ladies were asked to come to the front of the sanctuary during our worship service, where they stood in a receiving line and accepted a gift for being a mother. As a child I thought this was fabulous, never realizing that what women want is not a carnation and a pat on the back, but a real I love you and a thank you from their families. A day off from doing dishes wouldn’t hurt either. It never occurred to me, not once, to ask why we did this. When you grow up with a tradition, it is easy to absorb these habits without ever questioning their purpose. But we should ask. In return, we should be given an answer—or at least, discuss how we can best support the people who are part of our community. I have a feeling that “gifts” and “applause” really are not that helpful, and cause more hurt than help. Over the years, I started hearing from women who struggled on Mother’s Day. The group was bigger and more diverse than I realized: women who were single, childless, or grieving a loss—a mother who died, a miscarriage, a stillborn birth, or the death of an adult child. It’s not that these women didn’t want to celebrate motherhood. Most of us agree, moms do thankless work every day and rarely get the appreciation they deserve. It’s just that tradition had made a spectacle of one group and not another, and these other women felt invisible. Left out. Forgotten. The message was sent, whether we intended it or not, that mothers were more important than the women who were not mothers. Fathers more important than childless men. Married couples more important than the single person. Any time we put one group on a pedestal, we alienate another group. When we send those kinds of messages, we begin to create divisions and hurt feelings, instead of unity and community. I believe there is a middle ground—that we can both celebrate and grieve, laugh and weep. I have been both the childless woman and the celebrated mom. I have buried my child and then struggled through my first Mother’s Day without him. You are still a mother when your child dies, but the day takes on a bittersweet overtone that no one seems to recognize, but yourself. Through my journey I’ve learned there are countless women who struggle on Mother’s Day, a sisterhood of broken women who struggle through the celebrations, but whose pain is remembered by those who reach out to the not forgotten. We are broken but strong. We are not forgotten. For more on this topic, listen to part two of my interview with host, Julie Rupp on the podcast Parenting Tomorrow’s Leaders, where I talk about helping the hurting mama on Mother’s Day. 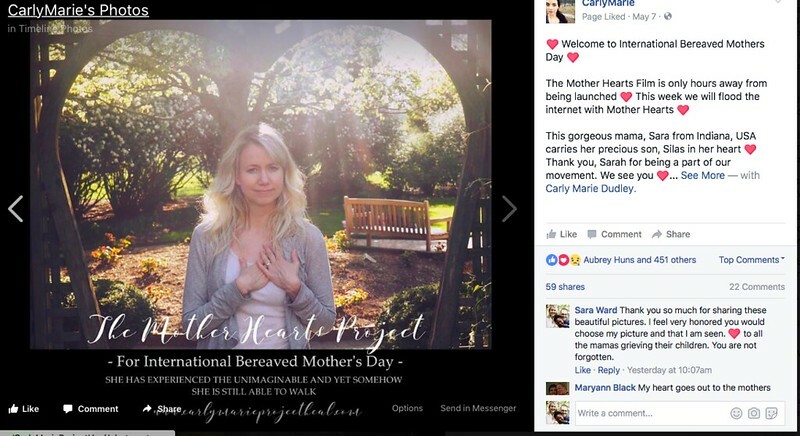 I submitted my picture to the Mother Hearts Project, which is a short film honoring children who have died and the mothers grieving for them. This was released Sunday for International Bereaved Mother’s Day. Over 1200 moms submitted photos and videos and over 900,000 people have viewed the film. I took this picture under the heart-shaped pergola in Foster Park. I hadn’t planned on taking this photo here or to even snap a picture that evening. I was wearing sweats, wandering through the park looking for tulips to capture. But it suddenly occurred that the heart pergola would be a perfect backdrop for the Mother Hearts Project and that the garden was where I spent much time when I was in deep grief. Although the sunshine behind me made the picture a challenge to take (most of the pics did not turn out), I love the way the sunshine streaming down gives an element of hope. See the photo selected for the Mother Hearts Project.